Enjoy FREE NEXTFLIX and HIGH SPEED INTERNET during your stay. Consistent high ratings and great reviews!!! Read below. 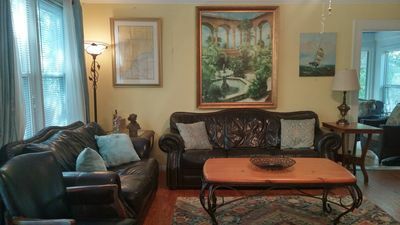 This property is located in a quiet residential area within walking distance of the beach, the Grand Pavilion, Tennis Courts, Bicycle Rental, Gym, Shops & Deli. Two championship Tom Fazio designed golf courses on grounds as well as a nationally recognized Tennis Center. 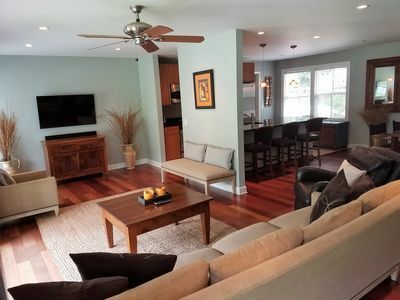 This is an exquisite property -- 2 master suites with king bed and private bath, 2 bedrooms with 2 twins in each, 1 bedroom with daybed/trundle bed – sleeps 10. Very spacious with many extras. All nine of us loved this beautiful house with a view of the Great Blue Herrons [SIC] tending their nest, the white egrets flying up to feed their babies, the golfers, the alligators – baby and big adult – the beautiful doe that appeared in the front yard one evening, the sounds of birds & tree frogs, and the relaxing pool fountains. The hot tub was a hit as was the beautiful pool. 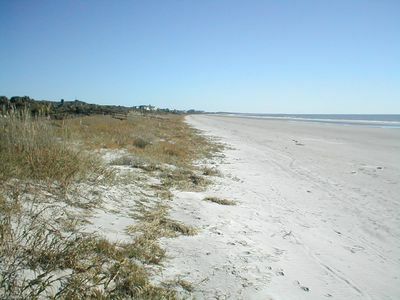 The beach was easily accessed by walking over paved paths. The kitchen was well equipped and we had plenty of room for all of us. We really enjoyed our stay at Edgewater Alley. 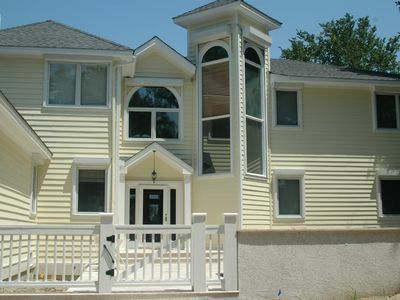 The house as a ton of space, including the master suite which has a closet big enough for a crib! 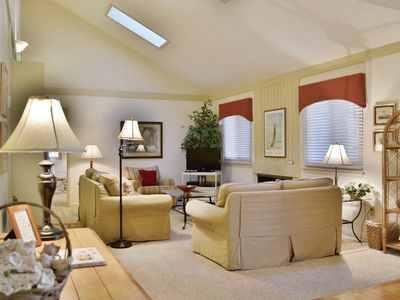 The home is well equipped with everything you need……Beautiful views of the golf course and such neat wildlife to see. The pool and hot tub came in very hand with out young kids too. 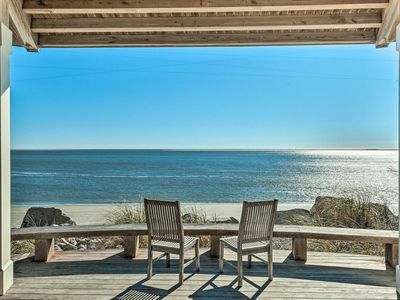 The home’s best feature may be the view from the enclosed porch and deck. The wildlife was fabulous. We loved staying here. The house was spacious and had everything we need. The kids loved being able to go out the front door to swim at the pool. Location and views of pond and golf course were outstanding. It was an easy walk to the beach. Very happy with this home. 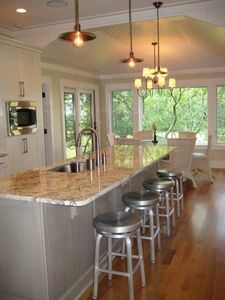 Loved all the living space and the back porch with all the rockers. 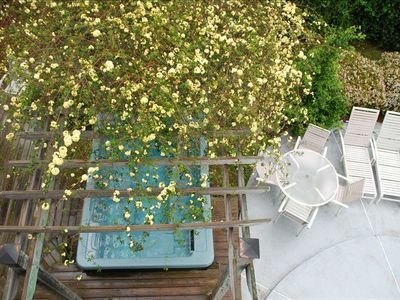 It was fun seeing the wild life from the back deck and of course we loved the pool and hot tub. A great place for our family vacation. Plenty of room. Loved “Fred” the alligator – Loved the golf view – felt nice and open – we all loved the pool and the beach. Rode our bikes, walked. Charleston was superb – ghost tour – carriage ride – shopping – eating. …. Also loved the kayaking and paddle boards. Had a fantastic vacation here at Wild Dunes. The weather was wonderful and the house was spacious and beautiful. “Chet” [the alligator] was our guest every evening as we played corn hole in the back yard. We enjoyed the surf, offshore fishing, and downtown Charleston attractions. Thank you for wonderful accommodations. This is a great house and we truly enjoyed our vacation. We say “Rex” the alligator a couple of times, spent a couple of good days at the beach, ventured into Charleston several times to sightsee, shop and tour the Magnolia Plantation. The Bransons of all ages from NY, Charlotte, NC and Connecticut had a fabulous week at your wonderful home. 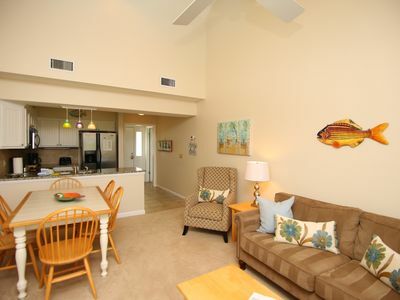 We too enjoyed the lagoon life as well as easy access to the beach. Your home was very welcoming. Thank you for availing it to us. Great week for the Larsons from Ashburn, Virginia and the Khans from Humble, Texas! We enjoyed the house with its special view of the marsh activities. The alligators visited daily and were a surprise for sure. Back for 2 weeks next year. Thanks for a wonderful vacation. Such a beautiful home! We had a great week. The kids really enjoyed the wildlife especially the gators. They spent much of their time in the hot tub as it was chilly most of the week, but it didn’t keep them out of the pool either. Thanks for sharing your place with use and we will be recommending it to our friends. A bit chilly this visit but a wonderful relaxing time nonetheless! One highlight was seeing a deer plunge into the ocean and swim a mile before jumping out and disappearing into the dunes. What a warm and cozy home for our family reunion. We love it here and the whole area. The Chalston/O’Donnel clan came together to help our daughter, son-in-law, and 2 year old baby settle into life in Charleston from Philadelphia. 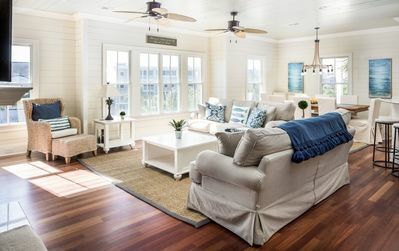 This beautiful beach house was a wonderful respite for this family. After unpacking boxes and tending to baby needs, it was so wonderfully relaxing to walk on the beach or sit on the back deck. 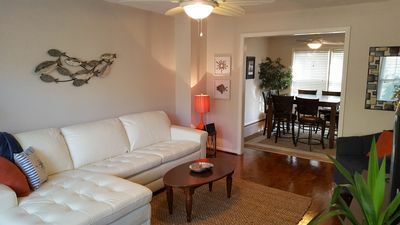 Your home had all the amenities we could have asked for and was very comfortable for our extended family. This was our first time on Isle of Palms, but we all loved it. We will be back. This was the best [50th] birthday ever!!! Four days of fun/visiting/beaching. It was a blast. The house was great and felt like home, and “Poco” (the alligator) was very entertaining! We saw some deer and now know why Poco hangs here. Can’t wait to come back. As you enter the gate, you find the in-ground pool/spa in the front of the house which provides complete privacy for fun filled water activities and a cool dip after a round of golf, sightseeing, or a trip to the beach. This designer front deck area is perfect for entertaining or just lounging. The landscape lighting and the built-in pool and spa lights provide just enough illumination for that late night swim or relaxing dip in the spa. As you enter this house you will see a breathtaking view of the foyer complete with cathedral ceiling. 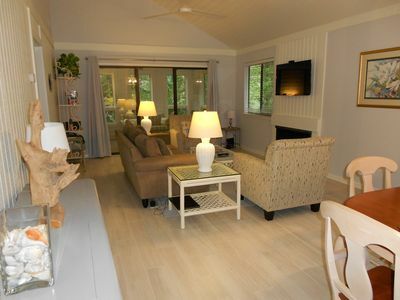 On the first floor are the family room, the kitchen, the dining room, the living room, and a bedroom with a trundle bed. Both the family room and the living room are equipped with large, flat screen LCD televisions (40” and 46” respectively) with DVD players and digital cable providing high definition shows and sports. The DVD in the living room also has surround sound. 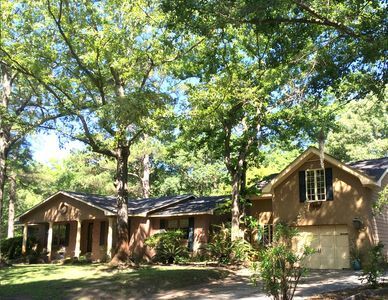 On the second floor you will find two master bedrooms with king sized beds, private baths and cathedral ceilings. In one of the master bedrooms is a 32” flat screen LCD television with DVD and digital cable. In the other is a VCR player. Also on the second floor are two bedrooms with twin beds. All bedrooms (up and down) have cable TV. 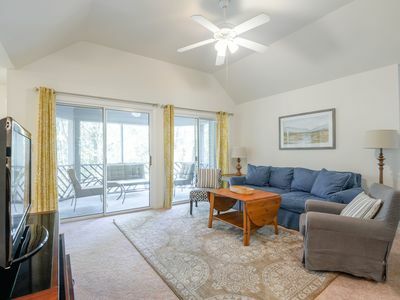 From both master bedrooms and one twin bedroom are double glass doors which open onto the balcony overlooking the backyard, lagoon, and golf course. 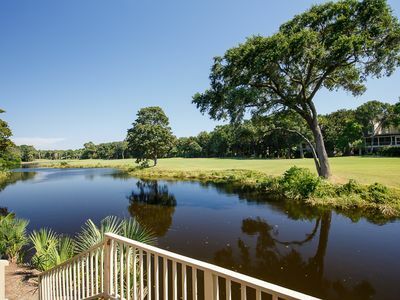 Upon awakening in the morning, enjoy your breakfast on the back deck while being entertained by golfers approaching the green of the 2nd hole. In the evening, after dinner, enjoy some of the magnificent sunsets which can be seen from the same deck. This house is truly a treasure. 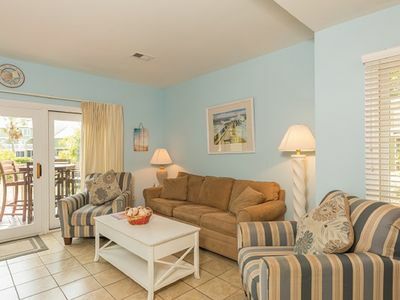 With plenty of room, an open floor plan, the pool, the decks, and the convenience to the beach, tennis, golf, shops, and more, your stay will be memorable. We had a blast and it is a beautiful house. Loved chillin’ in the pool. We even watch an alligator eat a squirrel! Thank you so much for a wonderful place to stay – all so beautiful. The house was wonderful – we really enjoyed our time in this lovely Island living. Great time here at the house and the wildlife was awesome for the kids! Enjoyed our stay. Weather was hot but pool was enjoyed by all. Watching the fish jump was an enjoyable past time. Saw the baby alligators and turtles. A full grown one visited us each morning and evening and even came up on the lawn for all to see. Put in a lot of beach time, and shopping. All in all it was a memorable week. Great Stay! So sad to be leaving. We loved watching the wildlife in the back, from the baby alligator to the jumping fish. The beach here is so beautiful and the pool was perfect to come home to afterwards. We had beautiful weather all week and enjoyed watching the golfers and gators in the morning and relaxing in the hot tub and pool in the afternoon and evening. Beautiful house. Great location. Recommend renting bikes and riding around not only Wild Dunes but also the Beach. NO SMOKING - NO ANIMALS allowed. FABULOUS VACATION RETREAT!...... PLUS A SEPARATE PRIVATE STUDIO LOFT! 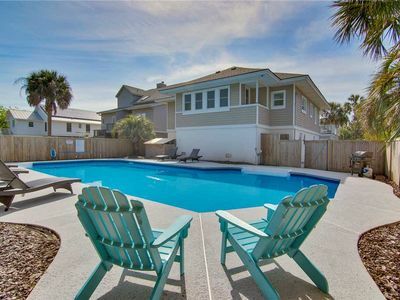 Pavilion Place on Isle of Palms ~ PORCH, POOL ACCESS, STEPS FROM THE BEACH! 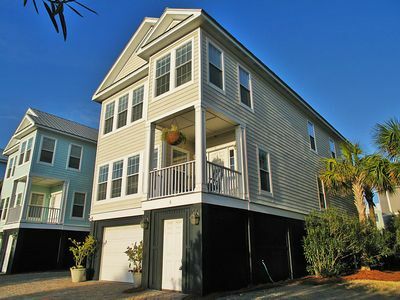 Across From The Beach- Private Sunroom, Fenced Yard & Private Pool! Premier Inlet Cove Cottage with River View– A Splendid Retreat, Community Pool! 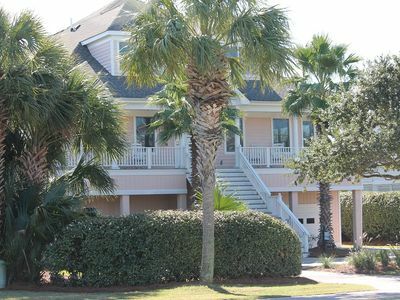 SPACIOUS FAMILYBEACH RETREAT W/ POOL & HOT TUB ! ! Open 3 bedroom Ranch! Great Central Location! Amenity Cards! 1st Floor End Unit! Pet Friendly! Amenity Cards! Panoramic Water/Beach Views! 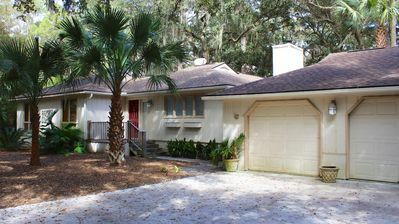 Woodland home w/ large back deck - 150 yards to the beach, dogs welcome! 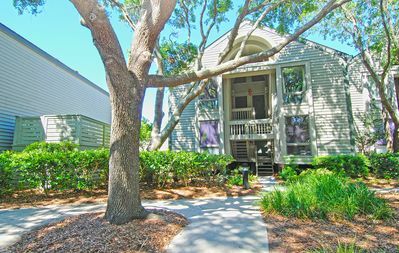 2BR Oceanside Condo + Wild Dunes Amenities!